Ok......We just got off the Dawn this morning and had an awesome week. Great food, great service, great everything... no complaints. Want to share a story that happened on Friday night, 10/9. We had two connecting balcony rooms, 10626 & 10628. My wife and I were in 10626 and my sister in law and her boyfriend Rob were in 10628. During the day we kept the connecting door open and closed it at night. We also opened the balconies so we had one long balcony. Friday night we went to bed. During the night Rob rolled over and went to put his arm around Judy. She wasn't there so he went to roll over to see if she moved to the other side of the bed. As he started to roll, he seen a woman sitting at the edge of the bed. He thought it was Judy and he said, what are you doing? Judy was on the other side of him and said 'sleeping." When he realized it wasn't Judy he continued looking at her, she was a woman with blonde shoulder lenght hair.. he thought it was my wife Nancy then. ( who is blonde with shoulder length hair). He said Nancy is in here, what do you need Nancy? Judy said, "Rob, your talking in your sleep." Rob said I AM NOT SLEEPING.....Then the woman stood up and had a light around her, she was smiling at him. She continued smiling and he said she floated towards the closets in the room..... she then disappeared in front of the closets. He says, he thinks that was her. Before I even got to the end of your story I wondered if it was the woman that fell to her death. Truly... Haunting the Dawn is the way to be a ghost! It's way better than haunting a cemetery or the Queen Mary.... The Queen Mary's Pool cannot be filled because the supports and struts underneath the pool were taken out, so the structure can't support the weight of the water. AND there's no casino! 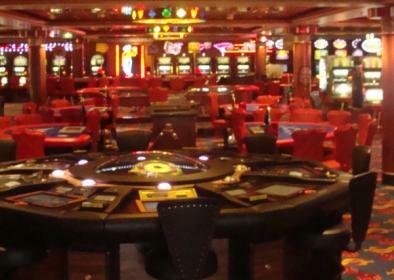 What's a cruise ship without a pool and a casino?! Ah ... you're absolutely right!! She was trying to get back to stateroom 9560 according to the New York Post. So she upgraded to a better suite. That story did give me the chills, Kevin! I hate to break the spell - but did you play the roulette wheel? What number did you play and how did you do? We played the newer automatic roulette wheel, and trust me.....11 was the hot number. It was always coming out. I played and hit it a few times and shook my head when it came out and I wasn't playing. I played mostly the crap table and did very well...payed my whole weeks bill with the winnings ! That is terrific, Kevin! I am glad you had such a great time! Thanks for sharing the ghost story too. At least she was a friendly spirit! I totally believe in spirits and have had an experience of my own that still gives me chills. Yeah, a very good story, we have things happen all the time at home, so if we have an encounter in january, it wouldn't feel out of place. Nifty story! We had heard there was a ghost on the NCL Spirit (no pun intended) from her days in Asia. In 2006, my wife asked the Captain about it over dinner and he said it was true, she visits the Asian restaurant late at night and frightens the crew. He said they had seen "things" (unspecified) on the ship's security cam. The young woman hanged herself in her cabin, and was cut down by one of the officers (who was sitting at the next table and confirmed the story...) Woooo! Great story! Always love a good ghost story. Too right I would be moving my cabin. I went all cold and goosebumpy reading that story. (we missed you at the Meet and Greet) She didn't make it to our cabin 9710. 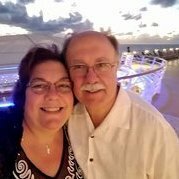 We too had a wonderful cruise!